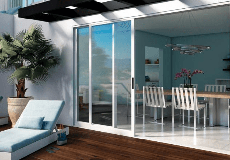 Coast Door & Hardware offers a wide range of quality doors, windows, hardware and trim. Their services range from small residential projects to large commercial projects. They offer professional in-house installation, do their own plan take offs, and order factory-direct. Located in Westlake Village since 1994 and with over 120 years of combined experience, their staff and installation crew is committed to giving you the service you deserve with quality craftsmanship and competitive pricing. Thousand Oaks, Westlake Village, Calabasas, Agoura Hills, Malibu, Woodland Hills, Warner Center, Topanga Canyon, Encino, Tarzana, West Hills, Hidden Hills, Oak Park, Newbury Park. COAST DOOR & HARDWARE is rated 5.0 out of 5 by 5. Rated 5 out of 5 by michael8911 from Love our windows and dealer was very knowledgable Finally purchased windows for my home and love them. Had old steel casements that were not sealed well and always made the house cold. What a big difference with the new vinyl windows. I am very happy with everything. Rated 5 out of 5 by Denifer from Great experience! I had been foot-dragging on the project to replace my ocean-facing French doors which had been consistently leaking during rainstorms. For years I tried handymen to fix the weather stripping, the molding and the hardware on the old custom doors. To no avail. So I bit the bullet and hired Coast Door to install new Milgard doors and was so pleased with the experience. These guys were so professional, experienced and thorough in the installation of 2 sets of doors on 2 separate floors...amazingly all in one day and with a beautiful clean-up job after. I whole heartedly recommend the product and Coast Door. Rated 5 out of 5 by Annieb46 from Coast Door - a quality company with exceptional service! After researching various door & wind dealers, we felt most comfortable with Coast Door & Hardware for the purchase and installation of new doors and windows in our home. Also, their pricing was very competitive compared to other dealers. In retrospect, it was an excellent choice. Our salesperson was very seasoned and knowledgeable about her industry. Her guidance and help made the whole process less daunting. The crew that installed the doors and windows were truly craftsmen in their field. They were always on time, very neat and their work was excellent. We love our new windows and doors and would highly recommend Coast Door & Hardware. Rated 5 out of 5 by doherty4 from the best customer service!!!! Especially Lynette! At Coast Door and Hardware very happy with the selections/styles great customer service when we had an issue with ine of the windows....turns out it wasn't installed square. Rated 5 out of 5 by CBT15 from Highly recommend Coast D&H for their great service! Coast D&H replaced all of our house windows plus FR french doors. They also installed sliding doors where a window previously existed in the DR. The Coast D&H employees were extremely knowledgeable and professional throughout the entire process. They did an amazing job - from helping us figure out the best Milgard products and style that fit out budget through the installation. We would highly recommend this dealer for anyone who values a quality job done properly.